Enjoy a short break on the wonderful Suffolk coast and save a staggering 35% on the cost of a holiday cottage that sleeps 6 and is dog friendly. It almost sounds too good to be true, but in this case it isn’t. You can book the lovely Seaford Beach House in Southwold with an incredible 35% OFF the brochure price between the 3-19th November AND the 8-22nd December 2012 (minimum booking of 3 nights). Seaford House is a large 3 bedroom house that sleeps 6, is family friendly (with cot and high chair available) and is also pet friendly. It has an enclosed garden with garden furniture and gas barbecue. Seaford Beach House is a spacious, comfortably furnished detached house situated in a stunning position on the cliff top at Easton Bavants near the pier. It offers sea views from most of its windows and is a stone’s throw away from the beach. It is an ideal retreat from the bustle of Southwold High Street but yet only a fifteen minute walk away. This is an ideal location if you require quiet accommodation with easy parking that is also close to the beach and town centre. If you are looking for a fantastic luxury break in October then you should check out our selection of holiday accommodation in Devon, Cornwall, Dorset, Somerset, the Isle of Wight and Wales. In association with travel partners Blue Chip Holidays you can choose from traditional cottages to luxury town houses, or how about converted Victorian villas and modern apartments. Characterised by luxury fittings, sea, river or countryside views, en-suite bathrooms and excellent locations, it will come as no surprise that most of this self catering accommodation is 4 star or 5 star. If you are not sure where to head take a look at our luxury holiday selection for some great ideas and then you can check availability and book online. If you are looking for something last-minute simply call for the latest availability and some great last-minute deals on 0844 704 4966. What’s even better news is that Blue Chip are currently offering 15% off selected October holidays, call to find out more. Much of England is poised to be sun-soaked this weekend according to the weather forecasts so why not book a last-minute weekend break or short break in a cottage, apartment or holiday flat to make the most of the last days of summer. It can hardly come as a surprise that the minute the school holidays are over the weather takes a turn for the better, it’s the frustrating British weather we all know and love. However, if you still have some holiday left or just want to take advantage of this exceptionally warm weekend then it is worth checking out our September holiday self catering cottages, many available at some excellent prices. The best of the weather appears to be in the south-east of England and the Eastern side of the country particularly on Sunday. But pretty much all of England will see plenty of Sunshine this weekend. Sadly for Scotland and parts of Wales things don’t look quite so bright but the temperatures look good (and who can trust weather forecasts anyway?). You are in for a great holiday in England this weekend whether you head to a country cottage or a coastal get-away. If you are heading to the South West of England it is a great time to dig out the body boards and surf boards as there tends to be good waves at this time of year and, if not, there is plenty of time to lay on the golden sandy beach! We are also pleased that the good weather will last over the last few days of the London 2012 Paralympic Games including the closing ceremony, so hopefully no need for the umbrellas! If you aren’t able to get away this weekend the good news is that you should be able to enjoy a spot of sunshine in the garden. This August 2012, get ready for a summer of jaw-dropping stunts, stomach-churning rides and festival vibes at the nation’s Thrill Capital! Join THORPE PARK in Surrey between 17th and 26th August for extreme heat as Sun SCREAM returns this summer. Brave Europe’s tallest winged rollercoaster THE SWARM, with its 127ft head-first inverted drop and terrifying near-misses as you rip through the apocalyptic annihilation, swooping beneath the wings of plane wreckage. Prepare for the twisted horror-coaster SAW — The Ride, or take the ‘Unholy Trinity’ challenge: Stealth’s full-throttle launch from 0-80mph in under 2 seconds, the ten-looped Colossus and the inverted hell ride on Nemesis Inferno. Thorpe Park is one of the South East of England’s top attractions and is perfect for a short break or a visit on your holiday. You can find some excellent self catering cottages and apartments close by to make the most of your stay in Surrey. What a wonderful day out Goodwood Festival of Speed in West Sussex is, so much to see and do for young and old, simply packed full of entertainment whether you are a petrol head or just having a passing interest in motor sport. We were newbies to the Festival so when we arrived early on Friday morning, when to be fair the weather was a little damp, we weren’t sure what to expect. The first thing that hits you is the sheer scale of the event, its huge… the car parks alone stretch for miles (do make sure you make a note of where you parked because finding it later is a challenge). Once inside you are straight in to manufacturer display areas that are located near the start line of the Hillclimb. Here you will find lots of sparkly new and exhibition cars from some of the world’s top car manufacturers. While making your way through the stands you can’t help but hear the cars roaring away from the start line, its amazing how exciting the noise is, and so you quickly move on to see some of the action. The Hillclimb circuit is the centre piece of the Festival of Speed, weaving its way from the entrance/start line past Goodwood House and up to the forest finish line 300 feet higher on the chalky South Downs. The straw bale lined circuit lets you be safely close to the action so you can not only hear but smell the rubber being burnt! There are grandstands along the track but you can also just walk and find a good spot to watch the action. There is a full programme on the Hillclimb throughout the day including vintage cars, grand prix motor cycles, Formula 1 cars, rally and touring cars and supercars… some racing, some doughnutting, some simply out on show! Walk through all the paddocks and see all the cars up close, when they are not performing of course. From the Grand Prix cars who seem to have teams of people working on them with all the electronic gadgetry to the vintage cars where you can simple appreciate their beautiful designs and admire the nerve it must have required to drive them at fall speed with so little protection. However there is so much more than the Hillclimb. 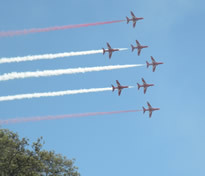 I was not expecting the air display to be so awesome, but the Red Arrows performing dare-devil stunts across the bright blue sky was pretty special. And as for the Eurofighter performing high-speed manoeuvres, wow! The off-road activity centre looked great fun, and great to get some pictures of vehicles being pushed to their limits. At the very top of the estate you will find the rally stage, see cars navigate this professionally laid out 1.5 mile circuit through the forest against the clock. As we headed back down we discovered the huge display areas where there is everything from ‘cars of the future’ to the awe-inspiring prototype of the car that hopes to break the 1,000 mile an hour land speed. Just as we were wandering around this area we saw the amazing Moto X display with motorbikes quite literally flying through the air in every direction – definitely wish we had got their earlier as it was quite a sight. However, don’t let this put you off, it is a spectacularly good day and we would highly recommend it. Click to see our pictures of the Goodwood Festival of Speed on Facebook or here to find out more about how to get there and where to stay when visiting. Wow, I have just looked at the line up for this year’s Goodwood Festival of Speed. One word AWESOME. Now I am definitely not a Petrol Head, I enjoy the Formula One Grand Prix season but that’s as far as my motor racing knowledge goes, so when I started looking at the programme I assumed it wouldn’t be my thing. But, I was very wrong. Starting next Thursday (28th June 2012) through to Sunday (1st July) it is packed full of attractions, events and family fun. The 2012 theme is ‘Young Gun – Born to Win’ which will be celebrating the drivers, riders, designers and engineers. At the Festival you get to see world champions try to set the fastest time of the day on the famous hill climb that runs up the Goodwood Estate. Or why not see the World Rally Championship teams compete through the Forest on the demanding circuit. Of course there are lots of fast cars, both modern and vintage, to see including supercars, dragster and rally cars. See 4×4’s performing at their limits on the off-road centre and check out the future of motoring in the FOS-Tech Pavilion. Add to all of that dramatic air displays, family fun at the Junior Festival of Speed, exhibitions and interviews with stars all against the backdrop of the wonderful Goodwood House and Estate and you get some idea of what’s on offer. There is so much to do it is well worth making a weekend of it! 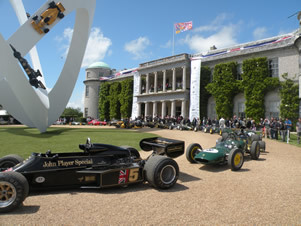 Find out more about the Goodwood Festival of Speed Cottage Breaks. If you go along, tell us about it below or upload some pictures to our Facebook pages. Wow, the sun is out, it’s even starting to feel like a pleasant summers day down here in Sussex! Dare we even go as far to say that may be now, while we are feeling super positive, would be a good time to book our Summer Holiday? 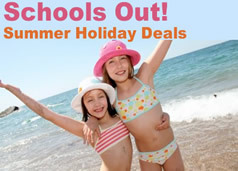 If like us, you have been waiting for the signs that we are going to have a summer in 2012 before booking your holiday, then time is beginning to run out. So we are taking today’s bright start as a good sign and getting down to the job of deciding exactly where we are going to go this year. Our search is, unusually for us, around the Kent area this year. We are normally South West of England addicts, having already stayed in East Devon earlier this year and regular visitors to Cornwall, but with the Olympics in mind we are keen to stay closer to the action. Kent is handily placed for day trips to London, but the ‘Garden of England’ has a lot more to offer than that, including wonderful rural villages, Blue Flag beaches, rolling patchwork countryside and Kent attractions such as Leeds Castle, Kent County Show and Gardens to Visit. We have checked out our Kent cottage reviews and have seen some great places but if you have any recommendations then let us know. If you are booking your holiday today, happy searching.